Loaf Bakehouse was an idea conjured up within the confines of a 670 square foot row home in Fell’s Point, Baltimore. We were initially just baking enthusiasts attempting to find enjoyment in a tactile hobby; a hobby nice enough to come with the added benefit of consuming the finished product. As the baking continued, the scope of the hobby began to take focus – we became obsessed with baking the ‘old-world’ way, utilizing a sourdough culture as opposed to commercial yeast or chemical leavening agents. 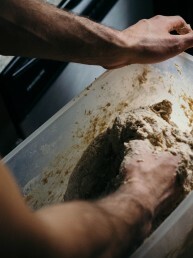 We soon discovered a little bread community within the city of Baltimore and began working with local farmers and millers to source organic, heirloom varieties of wheat and grain for baking experiments. 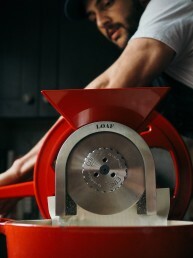 Investing in some equipment and continuing to tweak recipes eventually brought us to the point where a small-scale operation began to seem viable. After continued research and communication with local markets and vendors, we were fortunate enough to land ourselves a stall at the 32nd Street Farmers Market in Waverly for the Summer 2018 season. Our aim is to produce a variety of naturally leavened bread and pastry with a focus on highlighting locally sourced, organic grains. We look forward to sharing our creations with you and hope to see you at the market! 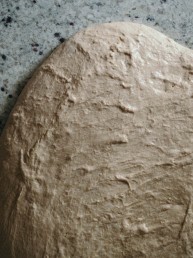 Bread that is naturally leavened (sourdough) is risen without the use of commercial yeast or chemical leavening agents (baking soda, powder, etc.). 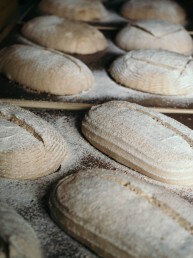 Instead, sourdough bread relies on a starter – a mixture of flour and water combined with naturally occurring yeast and bacteria – to ferment and subsequently leaven the bread. Evidence suggests that foods allowed a long, slow fermentation are actually easier to digest – this is why many people with alleged gluten sensitivities don’t report having any trouble consuming sourdough bread. Additionally, sourdough bread tends to have longer keeping qualities than its yeasted and chemically leavened counterparts. The lactobacilli present in a sourdough culture help contribute to this extended shelf life – when properly stored, naturally leavened bread has no trouble lasting up to a week. And if nothing else, doughs subjected to a long, slow rise benefit from a depth of flavor that just can’t be achieved in yeasted or quick breads. Our bread takes 2-3 days from start to finish, and it’s this long fermentation that unlocks different flavor notes and profiles. 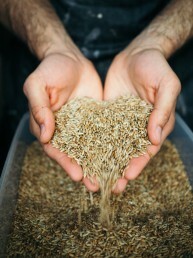 A grain seed comprises three parts – the starchy endosperm, the nutrient-dense germ, and the fibrous outer bran layer. Commercial milling practices utilize machinery that separate the grain into these parts from the outset of the process, eventually stripping out the germ and bran entirely. The reason for this is two-fold: industrial producers aim to create a whiter, fluffier product as well as produce a flour that has a stable shelf life. As a result, the consumer is effectively left with a big bag of endosperm devoid of any natural oils, fats and nutritional content present in the germ and bran. To make matters worse, many industrial producers will literally bleach their flour in an effort to make it appear whiter. They’ll even enrich and fortify the flour with some of the very same nutrients that were lost by the removal of the germ and bran. Imagine crushing up a multi-vitamin and adding it back to the flour after the fact – a bizarre reductionist solution at its finest. 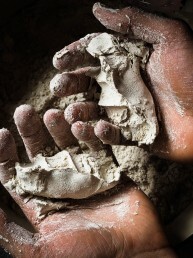 At Loaf Bakehouse we aim to respect the integrity of the whole grain seed by working with local farmers and millers that stone grind their flours in small batches and deliver us their product shortly after milling. We additionally mill many whole grain flour varieties ourselves, doing our best to include as much as possible in all our baked goods.